The majority of my research at the moment is focused on food security policy and discourses of food security as they take shape at the global level. Food security is a complex concept that has been well analysed and critiqued, yet despite the limitations and an overwhelming failure to achieve it, or even improve it worldwide, the term continues to dominate in policy discussions around hunger. I spend a lot of time wondering if the term is useful, and why we keep using it? Do policy-makers lack the creativity, energy or political will to come up with a new term? The evolution of food security policy serves to reinforce a broader neoliberal project, which helps explain why it has remained the main concept to begin to engage in conversations about hunger and access to food at the global level. Given the hegemonic nature of neoliberalism in global policy making, including across food security policy, it makes sense that powerful actors want to continue to use it. Just as it make sense that peasant farmers and food activities want to see more policies framed by food sovereignty. 25. The Conference suggested that FAO should organize a wide-ranging and dynamic debate with the participation of civil society and academia to discuss the concept of food sovereignty, whose meaning had not been agreed by FAO Member Countries or the United Nations System. While many of my friends and colleagues are pushing for this, but I personally do not want to see food sovereignty brought into multilateral processes where it would be debated and a concrete definition negotiated. This would serve to de-politicise and disempower the political framework (more on this in a future post). It would also serve to move it away from a movement discourse, which I think is where it garners the most strength and legitimacy. It is a powerful concept outside of the “iron cage” of the FAO’s bureaucracy. More thoughts needs to be put into weighing the pros and cons of this proposal by Latin American and the Caribbean, but I digress. Here are some of the issues I am grappling with concerning the concept of food security, especially in terms of moving forward and actually achieving the goals of food security: universal access to food. Food insecurity is embodied (normally a woman (mother)), it is located (usually Africa), and framed within a specific socio.cultural context at the local or national scale. 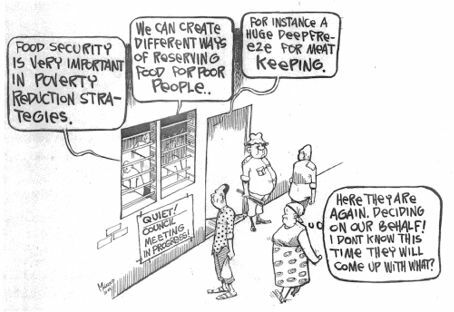 There is thus a disconnect between the way in which the end goal (food security) and the problem (food insecurity) are understood and framed. Food security is apolitical: fails to accept the political processes that contribute to food insecurity. In terms of policy making at the global level, states are being asked to monitor their own progress and to prioritise development. States predominantly continue to prioritise economic values: food security as an outcome of strong economy. It is a form of morality within the political economy and fails to address over-consumption or obesity and fails to break down systems: we talk of 1 billion hungry but fail to make appropriate links to, or recognise, obesity or, perhaps more importantly, the impact of western or wealthy consumption patterns on food security world wide. Analyses of food security policy at the global level begs the question: food security for who? I would be most keen to hear your comments on the issue. Another issue which has been considered in academic literature, which I did not discuss above, is contemporary understandings of “security”. From my experience working inside food security policy, there isn’t much confusion of “food security as access” with “food security as in national safety”. But perhaps this issue does exist outside of the halls of food security policy. Politicians and other non-expert decision makers are just starting to understand the term food security. Introducing the idea of food sovereignty at this point would likely just set us back by adding confusion. Yes, there’s a disconnect between ground level reality and political decision making. That’s the nature of political decision making in complex policy areas. It’s the role of the policy practitioner (the non-govt expert, or the bureaucrat, for example) to help bridge that gap. Introducing added complexity in the form of new terminology or deep academic thought is likely not useful. If you want pols to make decisions, keep it simple.